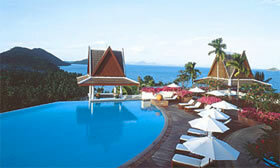 One of the pristine islands in Krabi province, Lanta Yai, is today a haven for Pimalai Resort & Spa. Built within the rainforest as it meets the silver strand, you would hardly know it was there. The boutique resort occupies 100 acres of tropical vegetation with a direct access to a 900 meters stretch of pristine sandy beach and offers 82 elegantly appointed rooms, suites and villas. Great thoughts have been placed by the architects in the resort lay out, ensuring that the contrast between architectural space and the lush embrace of nature is inspirational. The little buildings of southern Thai style design complete this natural environment allowing guest to be as close to nature as they wish. 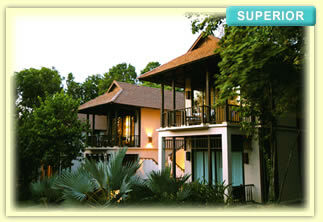 Our superior rooms are set in sixteen low-rise southern Thai style houses, each containing 4 rooms. Rooms are spacious with a minimum of 48 square meters including your own private balcony overlooking great landscapes. All are air-conditioned, feature polished teak wood floor, rattan curtains, rich Thai fabric and are equipped with either king size or twin beds. The bathroom either opens onto the bedroom or overlooks the garden. Very well appointed, it features bathtub, separate walk-in shower and toilets. The Bayfront Deluxe are individual Pavilion standing some 12 meters above sea level. 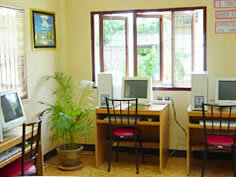 They provide great living space (70 sq.m.) 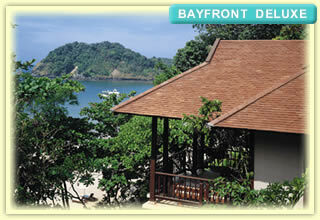 including a large balcony offering partial view of the beach, the bay and the surrounding lush tropical nature. The bedroom offers a great living space with polished teak wood floor, rich Thai cotton upholstery, rattan curtains and Siamese artifacts. A large bathroom with double vanity basins, separate walk-in shower and toilets; featured in this bathroom is a bathtub set behind a large window offering partial views of the bay and the garden. These fully air-conditioned elegant suites are available in combination of one or two bedrooms, with either 110, or 160 square meters of living space. Nestled amongst the trees they offered partial view of the beach, the bay and the surrounding lush tropical nature. All suites’ master bedroom have a king-size bed and offer refined Thai style interior design with polished teak wood floor, rattan curtains and Siamese artifacts. In the Pavilion Suite Two Bedrooms, the second bedroom is equipped with twin beds and features an oversized bathroom with double vanity basins and a bathtub overlooking a private manicured garden equipped with an open-air shower. The second bedroom is well detached from the master bedroom and living room building and therefore offers complete privacy to its occupants. The oversized bathroom of the Pavilion suite features double vanity basins, inside separate walk-in shower and toilets, and a bathtub overlooking a small manicured garden also equipped with an open-air shower. 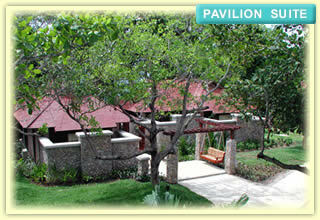 The Pimalai Dive center is a PADI associated diving facilities. It offers high standards of services, high quality of diving equipments and very good training facilities for those who wish to learn this great sport. The Dive center offers a comprehensive range of PADI diving and special courses from beginner to assistant instructor; one can learn how to dive how to dive in a small group or on a one-to-one basis. Experienced instructors (English and German natives) and qualified boat crews are there to provide maximum care to our divers. At last, our fleet of boats are available to whisk divers at comfort, at great speed and before anybody else to the highly rated dive sites located from 45 minutes to 1hr and 30 minutes approximately from Pimalai jetty. Koh Lanta’s dive season is from November to April. Our Dive center still operates from May through October (closed all month of September); however diving trips, usually towards Koh Haa and Koh Bida Nok are subject to weather and sea conditions. Befitting its status as the Southern gateway to Thailand, Hat Yai is the South’s largest and busiest commercial and shopping hub. 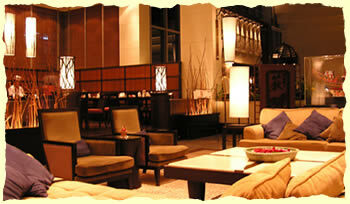 At the heart of this southern capital is Novotel Central Sukhontha, Hat Yai. Offering well-appointed rooms and suites enhanced by a fine range of facilities including dining and entertainment venues, catering services and a fitness centre. 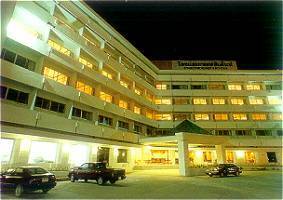 Novotel Central Sukhontha, Hat Yai has 238 rooms including 2 Deluxe Suites, 8 Executive Suites and 1 Sukhontha Suite. All guestrooms feature bedside light and air-condition control panel, refrigerator with fully stocked mini bar, private bathroom, Vingcard key system, IDD telephone, smoke detector & sprinkler systems, color TV with remote control, digital clock with alarm system, in-house movies, radio, emergency lighting, hair dryer upon request. 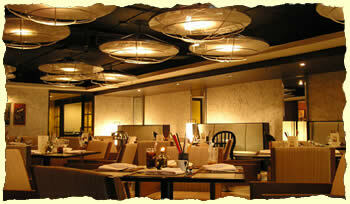 Ginger Thai-Japanese-Chinese; Authentic Thai, Japanese and Chinese Cuisine. Open Kitchen-Wine Bar-Live Music. Cozy and Comfortable Ambience. There is of course the Business Centre where executives can have all their business requirements efficiently processed through up-to-date equipment and top-notch secretarial services. And at the end of a busy day’s work, guests may unwind at the fully equipped Fitness Centre, or enjoy a Sauna, take a dip in the Swimming Pool, or ease your aching muscles with a traditional Thai massage. Sukhontha Hall accommodating up to 350 persons including pre-function area, can also be divided into 3 smaller meeting rooms. Support facilities include overhead and slide projector, screen, video, etc. 3 kilometers from the municipal market on Ratchadamnoen Road, this fine beach is characterized by soft white sand and beachside pine trees. The major landmark is the Golden Mermaid statue fronting the headland. (Folklore Museum) is located on Ko Yo hill, some 10 kilometers from Songkhla or merely 20 Kilometers from Hat Yai. The museum houses a collection fo southern Thai folk arts categorically grouped into Folk Technology Park, Shadow Play Garden, Ancient Beads Garden, Traditional Medicinal Garden, Bamboo Culture Garden, etc. A great variety of local plant species within the museum’s compound makes it an exceptionally appealing place. Most visitors spend daylight hours shopping in Thailand’s third largest city. Electrical goods at the Kim Yong market, durians and apples from street vendors, and Bangkok-made leather goods and fashions in the department stores are a few of Hat Yai’s popular buys. Andaman Lanta Resort for a relaxed getaway on one of Thailand’s most peaceful islands and enjoy our hotel-standard facilities and services. 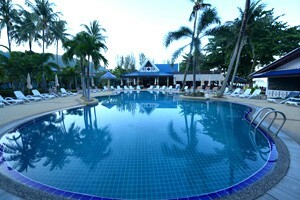 Tucked away under towering coconut palms, the resort is located at the south end of the tranquil Klong Dao Beach. Heavenly white-sand beach and turquoise blue water are just steps away from your beautifully appointed hotel room or bungalow complete with western-style. Away from the hustle and bustle, the resort is still within Klong Dao’s central district and a short taxi ride away from shopping, diving centers, restaurants and clubs. Our on-site Travel Desk will be happy to help with motorbike and jeep rentals, as well as tours and activities on and around Koh Lanta. 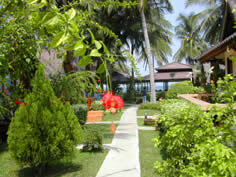 Come and see why guests return year after year to their tropical island home away from home on the Andaman Sea. that can be connected and offer the ideal choice for families. mountain view side with A/C, Hot-cold shower, TV, Minibar and fridge, IDD phone. with A/C, Hot-cold shower, TV, Minibar and fridge, IDD phone. equipped with A/C, Hot-cold shower and bathtub, TV and DVD player, Minibar and fridge, Tea/Coffee Boiler, IDD phone and safety box. Andaman Lanta Restaurant serves classic Thai & European Food. Dining close to the beach you can enjoy the most beautiful sunset every day. 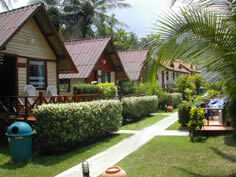 Andaman Lanta Resort, We offer the full facilities to make you the most comfortable. Andaman Beach bar where you can choose your lovely drink with our special cocktail. Swimming pool and children pool with sun bath seats. Private safety deposit box in each bungalow. 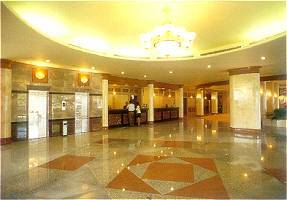 President Hotel, newly renovated provides its guests “all in one facilities”. 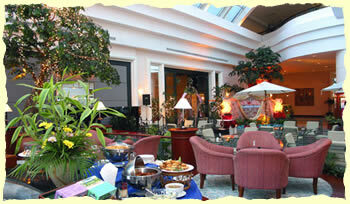 All of our 110 fully furnished Rooms and Suites are elegantly decorated for your comfort. Each room has individually controlled air-conditioning, wall-to-wall carpeting, private bathroom with hot and cold water, colored T.V. with in-house videos, telephone, fax services, mini-bar and a 24 hour room service. The President hotel is located just a stone throw from downtown shopping centers, fruits market, theatres and taxi & bus terminus. It’s only a 15-minutes drive from the Hatyai International Airport. Night entertainment spots are only a minute ride away from the Hotel. Whenever you are in Hatyai come and experience our friendly service and we promise to make you feel at …….. “home away from home”. Pha-Ngan-Cabana is located on the western shoreline of the world famous “Koh Pha Ngan” island, which of intimate look into Thailand’s smooth sandy beaches, coconut trees, natural coral reefs and diverse sea-life, combined with the serenity and the simple quality of life in nature that rejuvenates the mind and the soul. Our beach front offer dramatic view of Angthong National Marine Park, a group of virgin islands is one of the best places to explore. Pha-Ngan-Cabana is state of the art bungalows offer a single or double bed high standard accommodation, with the luxury of a private bathroom and full air-condition, in our wooden Thai style bungalow units. Type A :- The A/C room with a private bath room (twin). Type B :- The A/C bungalow with 1 bedroom (Double). Type C :- The fan rooms with a private bath room (twin/DBL). Pha-Ngan-Cabana is luxurious restaurant offers an endless variety of fresh daily picked seafood, Thai dishes, Italian meals and American or health food, so come explore the fascinating. Let your worries go a relax comfortable for endless hours of for endless hours of swimming and sunbathing next to a cool fruit shake on our private poolside. If “Action” is the name of the game for you. Then our beach football, scuba diving site and motorbike trips will allow you to sweat it out, and come back in the evening exhausted to sit in our open satellite TV lounge, watch a romantic sunset and enjoy the latest movies shows. 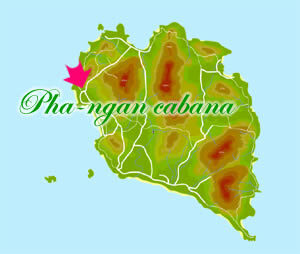 The Island’s main city and port of “Thongsala” ‘s location is only 10 minutes away from our peaceful beach resort. If ” Action ” is the name of the game for you. Then our beach football, scuba diving site and motorbike trips will allow you to sweat it out, and come back in the evening exhausted to sit in our open satellite TV lounge, watch a romantic sunset and enjoy the latest movies shows. 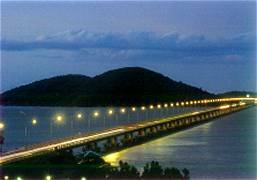 The Island’s main city and port of “Thong Sala ” location is only 10 minutes away from our peaceful beach resort.